Susan Jappie is inspired by Indian eco-activist Vandana Shiva’s new book. Making Peace with the Earth brings together all the evidence and arguments about the urgent need for a transition from the ruling values of the capitalist system. She argues for a paradigm shift from the neo-liberal ‘free-market’ economic model and ideology that ignores social and ecological costs, saying that model should be replaced with a world view that puts the Earth and all her children at the centre of our value system. Shiva, who originally researched the philosophy of quantum physics, helped to found the Navdanya biodiversity organisation. She is perhaps best known for her campaigning on bio-piracy, against GMOs and her challenge to the patenting of genetic codes. In this, her latest book, she focuses about her own continent of India to give graphic examples of each of the issues she explores which are contributing to the present crisis. She examines climate change and increasing inequalities as the multi-national corporations push the rural Indians off their land to mine for minerals, build dams and replace small farms with giant agri-business, leading to migration to city slums and suicides. The effects include increased militarisation as more displaced tribal groups stand up for their rights. She explains that the undermining of the rights of tribal peoples has driven them towards the Naxalite-Maoist movement. This has expanded its control over a third of India – or half of India’s 28 states. Shiva notes that intra-tribal killings intensified after a government-backed anti-insurgency operation was launched in 2005. It is the growing resistance to corporate undermining of the sovereignty of local land, that endows a positive side to Shiva’s argument. She adds her own experiences of resistance movements, like the Women’s Environment and Development Organisation which she co-founded after the 1992 Earth Summit with its Agenda 21, to the world-wide examples of the Occupy movement and the Spanish democracy movement, the Indignados, and amongst indigenous peoples. Challenging water privatisation and land-grabs, Shiva suggests that scientists have moved on from the dualistic model that sets human beings as separate from the rest of nature, as they embrace the inter-connection of all things. We need to combine this with the ancient wisdom of people who had to live in harmony with the earth and talk about “vivir bien” (living well) in co-operation, not competition, she insists. In 2011, the United Nations General Assembly approved the Bolivian government motions calling for harmony with nature. These spoke of the need to overcome eco-apartheid, eco-imperialism and the commodification of nature. Corporations shaped by capitalist patriarchy thrive on these abuses as they re-write the rules of governance by deregulation to give themselves ultimate power. In her exploration of what should come next, “Beyond Free-Market Democracy”, Shiva challenges the “freedom” of corporations to exploit whom and what they want, how they want, using the fiction of a corporation as a legal person to justify their rights’ to have unlimited influence over political processes and (in a U.S. supreme court ruling of 2010) replacing the rights of citizens and “Mother Earth”. She uses compelling quotes from the great Bengali polymath and poet, Rabindranath Tagore, to give lyrical power to her points, such as the limitless hunger of capitalism as “a prolific weed” which: “is carnivorous and cannibalistic, feeding upon the resources of other people and trying to swallow their whole future ... with such voracity ... that it turns great portions of the earth into mincemeat”. She finishes with a clear outline of all the aspects needed in the transition from corporate control to earth democracy, which she has given with real examples of the dangers of limitless growth of GDP as opposed to the benefits of the growth of GNH (happiness and fulfilment); and from hierarchical monocultures to inclusive cultures of diversity and rights of humans, all life forms, women’s, indigenous rights and those of future generations. She cites the Ecuadorian constitutional enshrinement of the rights of nature since 2008, which helped Ecuador’s case against BP in the 2010 Deepwater Horizon episode. That also underpinned the Yasuní-ITT initiative which sought to ban oil exploration to protect the Amazon, winning international support from activists, including Shiva herself. 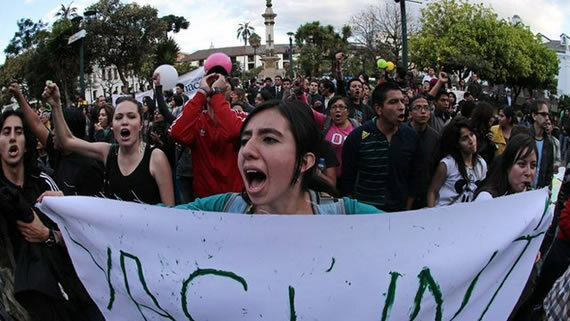 Ecuadorean president Rafael Correa currently faces opposition from eco-organisations who hope to halt oil prospecting by means of a referendum. 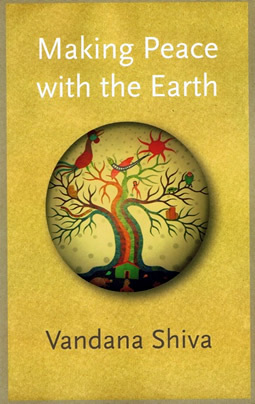 The global issues raised by Shiva’s book and her work on solutions will encourage all those who seek an alternative outlook as well a strategies for solving the eco-social crisis. I would highly recommend it to all our readers for its well-balanced arguments and engaging style.